Bernie had studied the scripture so much, even by the time he was in his early twenties, that with a few key words he could usually remember a verse and where it was in the Bible. Most situations he encounters can also trigger a few key words that "remind him of a Bible verse." (That's something he often says.) When he proposed to me, of course several bible verses came to mind, and these are the verses he used. The three strands represent two individuals, plus the Lord. Eccl. 4:9-12 "Two are better than one because they have a good return for their labor. For if either of them falls, the one will lift up his companion. But woe to the one who falls when there is not another to lift him up. Furthermore, if two lie down together they keep warm, but how can one be warm alone? And if one can overpower him who is alone, two can resist him. A cord of three strands is not quickly torn apart." Wasn't that a really great start for what has turned into almost 30 years of life with my dear husband? 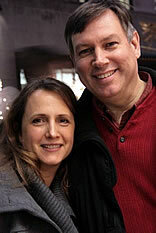 As I celebrated Valentine's Day this year, first and foremost, I am so grateful for him! We had a very unique Valentine's Day this year. The first thing that was different from normal was that for the first time he can remember, Bernie decided he wanted to call his Mom to wish her a Happy Valentine's Day. He is in frequent contact with her, but hasn't to his memory ever called her on Valentine's Day, when we usually are thinking of our sweethearts. But she is the only one of our four parents that is still living. He remembered the words on a plaque he bought her in Germany when he was there on a student exchange in high school. The words in German are: "Wenn Du noch eine Mutter hast so danke Gott und sei zufrieden. Nicht allen auf dem Erdenrund ist dieses hohe Glück beschieden." Which translated means: "If you still have a Mother, then thank the Lord and be content. Not everyone in this big round world is granted such high fortune." He reminded her of these words with his call. I think she was blessed and encouraged! Also, it just so happened this year that Valentine's Day coincided with a funeral for my Great Aunt "Lenie" (Arlene), my last living relative from my Grandparents generation, and the last to live in that area of Pennsylvania. She lived strong till the end when she fell and injured her head, and a week later after increasing confusion, she died. She was 92, yet in so many ways was very young at heart, and our family had really enjoyed the few visits we had with her in the last few years. She always had funny stories to tell, like the time she forgot she had stored some pans in her oven, and started the cleaning cycle, which melted the pans and caused a lot of smoke! These stories were told with her Pennsylvania German accent and its own adorable intonations; I wish I could type how it sounds, but I don't think I could do it justice. The area I grew up in was mostly settled by German immigrants, and there is much German in my background, all except my Dad's Dad, who descended from Welsh/English. But going back for generations with my other three grandparents, are names like Heiser, Dorsch, Hager, Dietrich, Merkel, Driebelbis, and even the French sounding Schappell was from the Alsace-Lorraine region. Because of that, Aunt Lenie's Pennsylvania German accent always felt kind of homey to me. Where we live now is in a town whose name was changed several times, from "Merry Peep o' Day" to "Berlin" to "Barry" to "Brunswick," across the river from Lovettsville, VA. Both towns were German settlements. Can't get away from it! Not that I want to. OK, enough about Germanness. So anyhow, Bernie and I decided to make the trip to the funeral to encourage the family. It was a sweet time. And since we were traveling to very near my home town area for the funeral, I thought it would be good to visit my parents' graves as well; they were the last of their generation in that area. With my parents' deaths, and now Lenie's death, there are now officially no more family to visit where I grew up, which feels kind of lonely and odd. My old grade school and high school are there, and all the buildings and things I grew up with, but most of the people, friends and family, are gone; they either have died or moved to other places. Although it has been almost four years since Mom died, and six since my Dad died, I realized a few weeks ago that it has really only been two years since the estate was wrapped up and complete. I also realized I am still probably going through the grief process with all its stages, and it would be good to try to wrap it up a bit more somehow. So it seemed fitting to say good-bye to my parents once again, really let them go (although I thought I had), and maybe look towards the future in a new way. 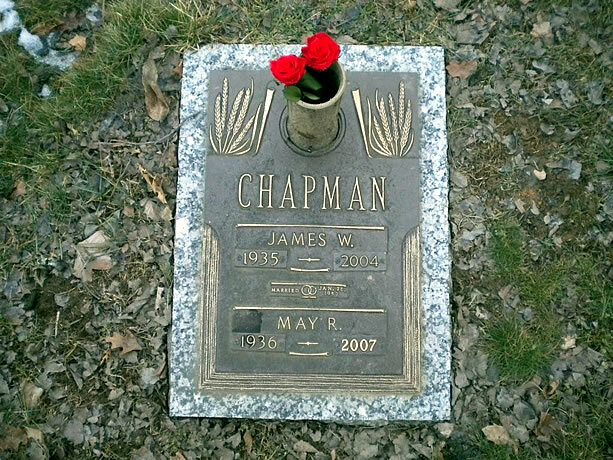 So Bernie and I took two red roses and put them in the vase on the tombstone, and I prayed and cried a bunch. Bernie thought the roses were real when he bought them, but they turned out to be preserved in some way, and it was nice to realize they will last a long while. So it really was a different sort of Valentine's Day, as it turned out, but death doesn't put an end to love, so it is probably appropriate to have at least one Valentine's Day celebrated in this manner. Then to continue to keep things different, we came home and went out to dinner with our family, rather than just the two of us, partly to celebrate that life goes on! And since we don't know how long it will be until they have their own 'sweethearts,' it just seemed a good year to celebrate Valentine's Day as a family. So we enjoyed a nice dinner at "Macaroni Grill," one of my favorite restaurants that we all really like, as an end to very different and kind of sober Valentine's Day. So I guess my encouragement to you is, show love to your family while you can, they won't be with you forever, at least here on this earth. And as you show love towards others, may you always know and experience the depth and unfathomable richness of God's great love for you! Please pray for these upcoming recurring events later this year. Thank-you!